In 2000, he founded NorthernBlues Music, a cutting-edge blues label. The company has released over 70 CDs, and has garnered 12 Juno Award and over 40 Blues Music Award nominations. In 2007, Fred started the Free Thinking Film Society to showcase films on liberty, freedom and democracy. The Society has now shown over 100 films and also organizes book launches and panel discussions. In the fall of 2015, Fred published his first book, Conservative Confidential: Inside the Fabulous Blue Tent, which detailed his journey from left-wing anti-nuclear activist Conservative Party campaigner. 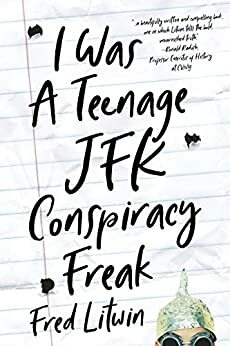 I Was a Teenage JFK Conspiracy Freak is his second book and you can find updates and pictures at conspiracyfreak.com. 5.0 out of 5 starsConspiracy theories wither in the light of day. Litwin brings us up to date with all the conspiracy theories spawned since the Warren Commission issued its report. He delves deep into many of the popular ideas, debunking each factually and carefully. The book is a very useful summary of those believing in the JFK conspiracy, with timely inclusion of today’s vast right wing conspiracists like Alex Jones. 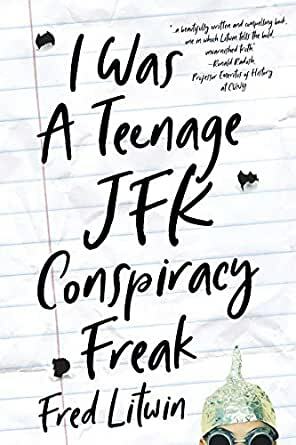 5.0 out of 5 starsEssential reading to place into context the myth of the JFK "conspiracy"
I, too, was a teenage JFK conspiracy freak. I grew up in Dallas and was constantly bombarded with the lure of conspiracy and the assassination. However, most people become wiser as they advance in years, and exchange hope and naivete for reason and logic. Mr. Litwin has done a wonderful job in chronicling this personal metamorphosis. Essential reading to place into context and expose the reprobates that have bastardized this tragic, yet doltishly-simple, event. The historical record is clearer now thanks to this amazing work. It's time to accept that a zero killed a hero, and move on. This book will help you do that. The author describes his personal journey from wanting to believe in a conspiracy as a young man trying to make sense of the assassination, through his maturing and gradual recognition that the hundreds of conspiracy theories lack substantive proof. 1.0 out of 5 starsOnly buy if you are an "LN"
Did nothing for me. Good start, hard to finish. Bored with nothing but negative views of anything different from the Warren Commission garbage report! I'm Japanese assassination resercher Hideji Okina. Oh! I see my early days from this book.